These pictures were taken c1940's. The property is a stylish bungalow with the then vogue Tudor styling situated in The Walk, Hullbridge. On one of the gates is the name "Twist Niet". 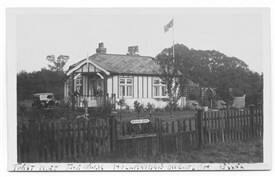 At the time these pictures were taken it was occupied by a Mr and Mrs Hale. 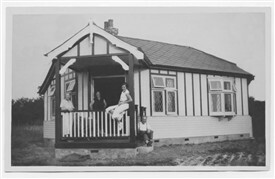 Later occupants were a Mr and Mrs Stuttle mentioned in "Memories of Hullbridge 2" in an article by Richard Dobson with comments by Jacky Willoughby. To view other photos and text in this Hullbridge series click on items in the "More about ..." index on the right, Bob Stephen (RDCA Admin). This page was added by David Whiffin on 13/08/2013.